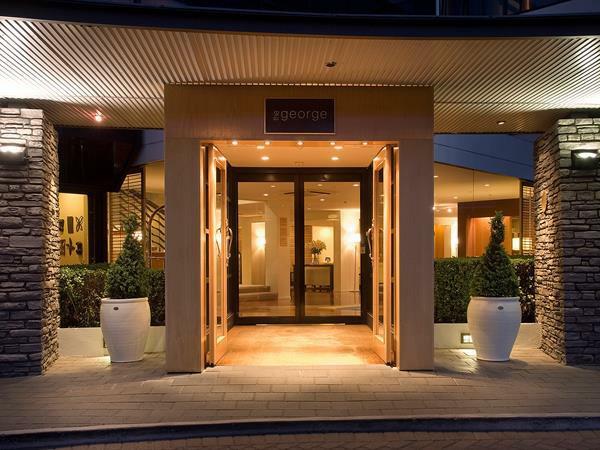 Located in the heart of Christchurch, overlooking the picturesque Hagley Park and the River Avon, The George, Christchurch combines luxury with attentive, friendly service. Just steps from the cultural precinct and key attractions and the only Christchurch hotel with a one-to-one staff to guest ratio. Small and elegant, this boutique hotel of 53 guest rooms offers an exceptional level of personal service throughout conference, accommodation and dining facilities. Conference/Banqueting facilities cater for groups of 8 – 160 people, so it makes perfect sense to hold your special event at The George, Christchurch. Whatever the type or size of the event, our team will design a function to suit your needs and budget. The hotel has six separate function rooms including The Residence, a newly refurbished luxury onsite villa with boardroom and living room opening out into private gardens. Our facilities can be used for a vast array of events including cocktail parties, meetings, private dinners, presentations, seminars, conferences, wedding receptions and product launches. Each room offers internet and multi-media facilities coupled with free car parking facility allowing easy access for all guests. Superb catering is a hallmark of The George’s cuisine team which maintains the same high standards set in our award winning restaurants, Pescatore and 50 Bistro to create individual menus for conferences and meetings. The George is an elegant boutique urban hotel located opposite Hagley Park and the River Avon, on the verge of the Christchurch CBD. The George offers a variety of event spaces and venues to suit any event from private boardroom meetings to more lavish affairs. Every event is delivered in an environment of seamless elegant, matched with award-winning cuisine and professional service. Located on Level Two is the Boardroom and Treasury, while Parkview and Annex spaces are located on Level Three. All levels are accessed by lift and stairs with separate facilities on each level. The Residence at The George offers a ground floor meeting and event space with natural light, an outdoor courtyard garden and use of the Library as an adjoining coffee break space or for pre-dinner champagne and canapés. The George is also home to two multi-award winning restaurants – 50 Bistro and Pescatore. Multi Beef & Lamb Excellence award winner 50 Bistro offers breakfast, lunch, high tea and dinner. Menus constantly evolve governed by the season’s bounty and the best Canterbury produce available. 50 Bistro spans three interconnected spaces including; a lobby bar for socialising, a light filled conservatory for warmer days and a modern chic restaurant. The Conservatory is available for group bookings. Christchurch’s only Two Har Restaurant in the 2018 Cuisine Good Food Awards and 2 Glasses in the Best of Excellence Awards from Wine Spectator – Pescatore offers a minimalist approach to formal dining that is comfortable and intimate. Re-awaken the senses with a dining experience in Pescatore and enjoy the synergy of art, science and cuisine. Pescatore is available as a private dining venue. Among Christchurch’s meeting facilities and special event venues, the six spaces at The George are each unique. Whether it’s a board meeting, a product launch, conference, private dinner or incentive cocktail celebration The George offers you extensive facilities, comprehensive service, excellent quality and attention to detail. Located opposite Hagley Park and the River Avon the hotel offers 53 accommodation rooms and suites. The George offers a range of room types and configurations including wheelchair accessible rooms, twin, double, king and Californian king beds, The George, Christchurch’s luxury boutique hotel is the essence of supreme comfort. All rooms have opening windows. Executive Rooms (8) Avg size 29/.3m² this lead in room type provides everything for a comfortable visit. Premium Executive rooms (32) Avg size 29.3m² designed to the highest specifications and situated on all floors, these sophisticated rooms offer the highest level of comfort. Junior Suites (4) Avg size 44m² these spacious suites were designed to provide additional living and bathroom space as well as full sized robes and custom made furniture. Park Suites (6) Avg size 58.9m², with captivating views over Hagley Park and the River Avon from a separate lounge area. The Residence (3) The residence has the feel of a country lodge overlooking The George’s private hotel gardens with access to full hotel services and the exclusivity of a private villa. Offering two suites and a loft The Residence can be utilised as separate suites or the exclusive use of the entire villa.